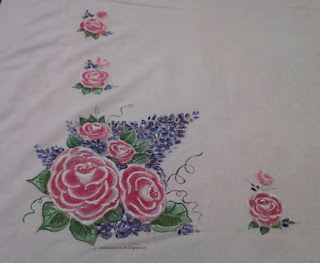 Fabric painting is a nice way of beautifying plain boring fabrics with your own design and style. Long back I had painted a favourite cartoon character on a bedsheet for a kid!Here is a short tutorial on how I did it freehand. 1First of all I bought a readymade plain bedsheet from a shop. 3 If you are doing it freehand like me leave 20" from the edges , you will get a rectangle.This can be a guideline for placing the pattern. 4 Keeping the sheet clean is a huge task but has to be done to avoid mishaps, fabric paints are permanent. 5 One can use a frame for painting, but I did not use one. 6 Try to do the flowers, then leaves and so on. 7 Shading can be done in a similar way. 8 Dark colors should be done first ,light colors go last for obvious reasons. 9 After completion let the colors dry for 24 hours , then iron on reverse side to fix them. 10 Handwash the bedsheet gently. I have used Decorative painting and one stroke painting techniques on the bedsheet and loved it! One stroke painting is my favourite technique too and quite addictive. You have done a wonderful job on wooden plaques and fabric. How did you manage to do OS roses on a cotton bedsheet? The brush does not move on cotton for me - did you base coat the area of painting with white paint first? Practise will get the desired results! Sleep is very important in a person’s life. That is why you should buy bed sheets in which you can lie comfortably and sleep peacefully. Always be happy to get a good sleep!